"A Moving Plea to God for Victory Over Sin and Violence"
PETERLOO is an impressive period drama about a political conflict in Manchester, England in 1819, when autocratic judges used the military to squelch a rally of about 60,000 people asking Parliament for the right to vote. PETERLOO presents an one-dimension portrayal of the judges, but it otherwise seems to be an accurate depiction of the violent event, which led to some political reforms. PETERLOO ends on a moving Christian plea for peace, deliverance and liberty, where a minister leads family members, mourning the death of a family member, in the Lord’s Prayer. The movie opens in 1815 at the Battle of Waterloo in Belgium, where British and Prussian forces defeated Napoleon Bonaparte for the last time. In the confusion, a lone bugler on the battlefield named Joseph fearfully blows his bugle during the fighting. With the battle ended, he walks back to his family in Manchester, collapsing in his mother’s arms. Joseph’s father attends political meetings concerning poor working conditions, low salaries and government restrictions on corn imports. Parliament has refused to give the people in Northern England, including Manchester, the right to vote. The meetings are run by moderate reformers, but more extreme firebrands want to do much more. Four years later, economic conditions and unemployment in Manchester worsen greatly, and the firebrands start supporting revolution, like the French Revolution, but with a Christian spin. Cries of “Give me liberty or give me death” ring out. Meanwhile, however, two moderate reformers return from London after being impressed by the oratory of Henry Hunt, a reformer who supports the right to vote. The reform leaders in Manchester ask Hunt to speak at a huge rally at St. Peter’s Field in Manchester asking for the right to vote. Henry is committed to a peaceful demonstration, but one reformer wants some of the protestors armed. So, Henry overrules him and bans him from the stage. Despite Henry’s commitment to peace, the judges who rule Manchester under the King have plans to call in the army. As families get together to hear Henry speak, disaster looms. 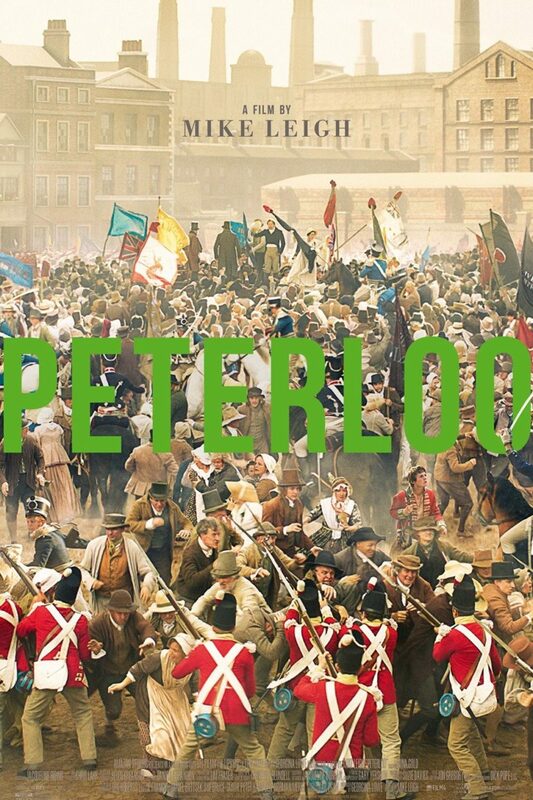 Writer/Director Mike Leigh, who often leans too far toward the socialist, leftist side of things in his movies, creates one of his most impressive movies in PETERLOO. Though he presents a somewhat one-dimensional portrait of the magistrates and the owners of the mills where most of the people work, the violent firebrands advocating the death of King George III and his eldest son, the Prince Regent of Wales, George IV, don’t come off too well either. Ultimately, Henry Hunt, the advocate for peaceful, limited reform, is depicted as one of the most noble players, though he’s a little naive. Even better, after a massacre kills and wounds dozens, the movie closes with a pastor leading the Lord’s Prayer as a family mourns the death of a loved one. The last line is “Lead us not into temptation, but deliver us from evil,” a moving Christian plea to God for peace, deliverance and victory over sin, including the violent oppression just witnessed by the family and the moviegoer. There are several other positive Christian references in PETERLOO. That said, some of the more firebrand reformers in the movie falsely claim Jesus was a social reformer like them. Of course, the extreme firebrands extol the French Revolution despite the fact that the French Revolution was rabidly Anti-Christian, deist and even atheist. The movie just reports their radical celebration of that Revolution, however, without going into much detail. Director Leigh often leaves it up to viewers to form their own conclusions. PETERLOO sometimes relies on political speeches to move the plot along. Otherwise, though, it’s a riveting, beautifully acted and well photographed epic showing the social and Christian background to a major event in British history. The immediate aftermath of the massacre was a crackdown on reform, especially when two other abortive uprisings occurred and a plot to blow up the cabinet was stopped. Eventually, however, Manchester won the right to vote in 1832 and Britain underwent a long period of reform. Caution is advised for some foul language, bloody violence and minor political, theological problems in PETERLOO. Conspiracy, oppression, people debate violent reform versus peaceful reform, but peaceful reform and non-violence are ultimately supported in a Christian manner. PETERLOO is a impressive period drama about a political conflict in Manchester, England in 1819. Four years after the defeat of Napoleon at Waterloo, the people in Manchester and Northern England suffer an economic recession. With no right to vote, the local magistrates appointed by the King deal harshly with the people. Local reformers in Manchester convince a popular London reformer, Henry Hunt, to speak at a big rally peacefully asking the government for the right to vote. The magistrates are frightened by this development and decide to call in military forces once Hunt begins speaking. Violent disaster occurs. PETERLOO sometimes relies on political speeches to move the plot along. Otherwise, though, it’s a riveting, beautifully acted and well photographed epic showing the social and Christian background to a major event in British history. Best of all, it ends with a pastor leading a mourning family in the Lord’s Prayer, closing with the words, “Lead us not into temptation, but deliver us from evil.” The ending of PETERLOO is a poignant Christian plea to God for victory over sin and violence.